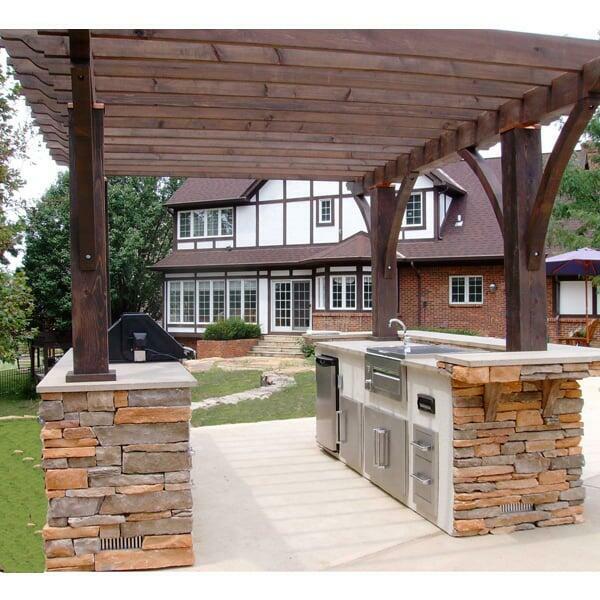 Do you need an Outdoor Room that offers the features and benefits of an outdoor kitchen? The "Vogel" Grill Island Project by Leisure Select offers everything you would need in a kitchen, situated outside under a beautiful Pergola. Add a Grill Island with storage boxes, a refrigerator, a stainless steel sink, shelves, a gas grill and even a stereo! Do you need a place to cook steaks while holding game-day parties with guests? Or maybe you need a space to take your family bonding to a whole new level? With the "Vogel" Grill Island you add an outdoor kitchen where visitors and family members can congregate and share a conversation! And this grill island project is completely customized; notice how the wood of the pergola matches the home's Tudor style. Maybe you like the look of this grill island but are unsatisfied with the color of the tile or stone? Mix and match the colors and sizes of the materials; we promise you will find a look that matches your home's decor. Add an outdoor kitchen that perfectly matches your home! Contact us today and ask about the "Vogel" Grill Island Project by Leisure Select! Simply the Best in Outdoor Kitchens. Luxury Outdoor Living Doesn't Get any Better!